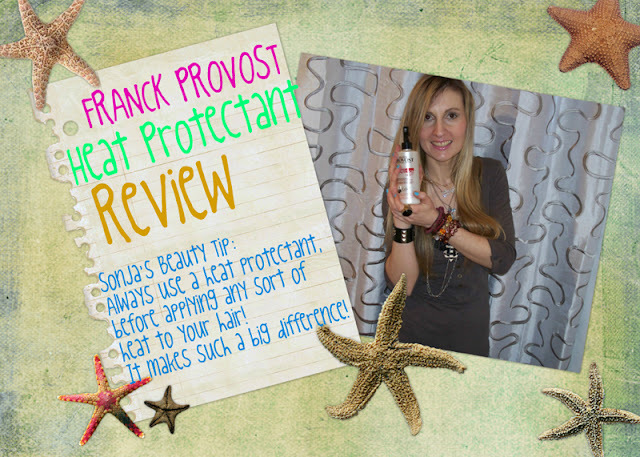 Trench Collection by Sonia Verardo: Franck Provost Heat Protectant Review & a Quick Hair Tip! Franck Provost Heat Protectant Review & a Quick Hair Tip! ...I'm a little bit behind with my blog posts, as this weekend I was super busy at work,and then yesterday, my granny fell at the supermarket (the floor was slippery because it has been raining), so we spent the entire afternoon and evening at the E.R.! I was so scared, I can't even describe you how shocked was I when I saw her on the floor! I think I almost passed out myself! She hit her head and was bleeding from her nose, so I wasn't calm until the doctors checked her head and her legs (she already walks with difficulties as it is!). I was so, soo scared you guys! My granny is like a Mum to me, I love her so much and I couldn't stand the thought of something bad happening to her! So this was the main reason for me being a bit MIA from my regular posting! 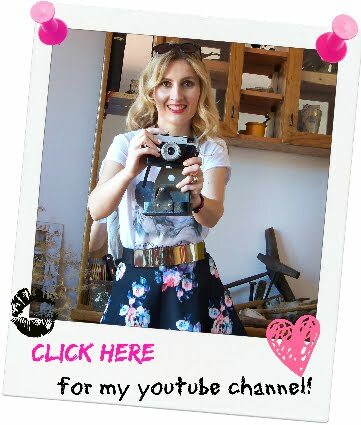 On youtube, I already have a few new beauty reviews & vlogs up, but I haven't been able to follow my vids with a blog post, as I normally do! You guys, I've been loving this heat protectant as it is a drugstore brand (I got it at my local "Acqua & Sapone" drugstore in Italy, but it is available in any italian supermarket basically!). It is very convenient price wise (under 10€) and the spray itself will last you probably from 6 months to up till one year! 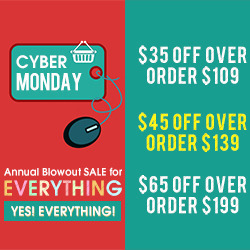 It won't weigh your hair down, make it greasy, or anything like that! When sprayed on your hair, it feels as if you aren't wearing any product, that's how light- weight it is. Yet, it will provide you with a good protection from the heat caused by blow dryer or other styling products that we use (almost) daily on our hair. Never style your hair (with heat) without a heat protectant! My hair is really long and I tend to cut it as less as possible (once, or twice a year!). My hair is colour treated (with blonde highlights). After washing it, I always blow dry my hair. My hair isn't naturally straight, so I like to use my ghd hair straightener, to acheive that perfect, straight, silky look! 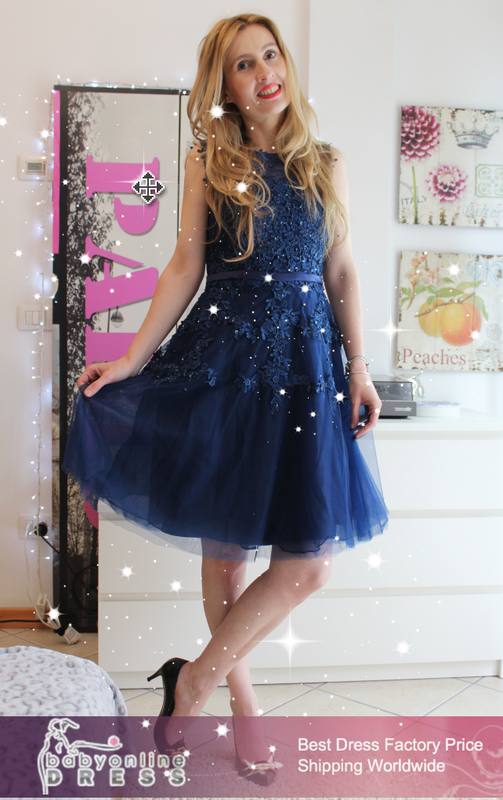 Lately, I've also been curling my hair with a hair curling iron (usually on my 2nd, or 3rd day hair!). That's a lot of heat and damaging to my hair!!! I wouldn't be able to keep my hair in such a healthy, good condition, without a help of a heat protectant. So my little tip is: Make sure to always use one, try to incorporate it into your haircare/ hairstyling routine! Especially if you're trying to let your hair grow long, you'll see, it'll make such a big difference in the general state of your hair! I'm currently using Franck Provost Heat Protectant Spray. 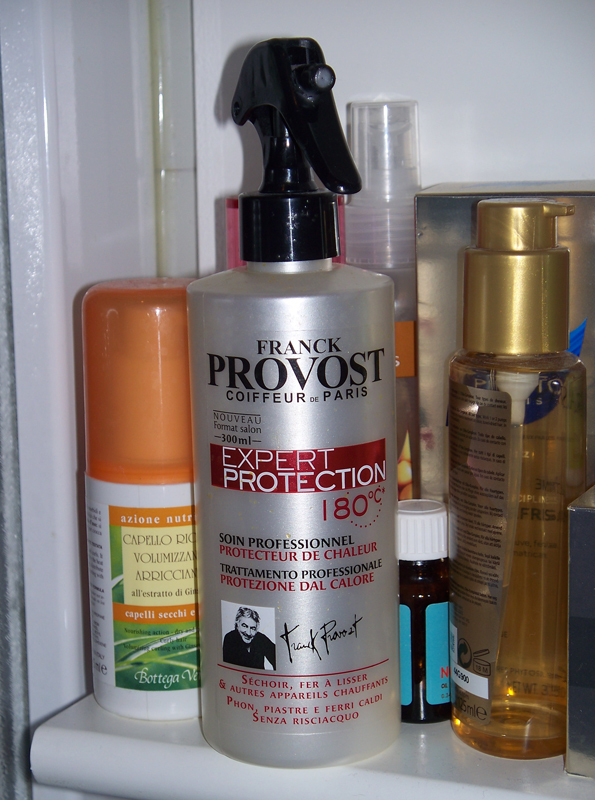 On this pic: Franck Provost Spray among my other hair styling products in my bathroom.